The Amazon Locker service was initially launched six years ago in September 2011 and as of today has somewhere in the neighborhood of more than 1,800 lockers in 50 cities world wide. We recently got one of these within a few miles of my home and I decided to give it a try and check out the process. It really is straight forward and handy for users who are concerned about packages being stolen after their delivered at their home address or missing a mail delivery. I imagine this would also be useful if you needed a delivery when you are traveling and gives you an option that does not include paying a fee to your hotel for package delivery. Since I work from home, I am almost always around for deliveries but I just used my Amazon Locker in the last week because I wanted a package to arrive without my wife's knowledge. See - late last week she accidentally broke a mug which I bought for her in Seattle a couple of years ago. So I went to Amazon and searched for it and found the exact brand and version of the mug and started the purchase process. In the final stage of the ordering process I was offered the option of having this package delivered to the Amazon Locker near me. I decided it would be a great time to try it out and share the experience so I selected it for the shipping destination and wrapped up my order. 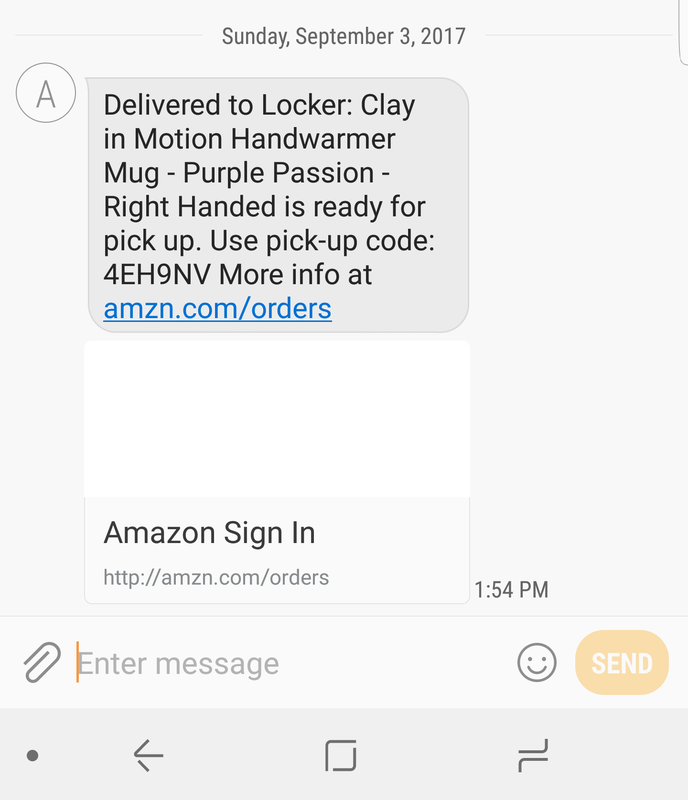 Instead of having to wait until after the Labor Day holiday for the two day delivery via Amazon Prime and regular shipping methods, the cup was delivered on Sunday well ahead of schedule. I received a text and email telling me it had been delivered along with a unique pickup code. The e-mail also contained a barcode that could be used at the Amazon Locker delivery location to gain access to my package. As you can see in the e-mail, I had five days to pick up the package before it would be returned to Amazon. Upon logging into my Amazon shopping account, I was also able to retrieve the package information for the Amazon Locker as well. Since I was already out of the house running errands in the area, I headed to the Amazon Locker location and retrieved the package. See the gallery images for a hands on of my pickup. The part of this process I did not expect to test however was using the Amazon Locker to return something back to Amazon. As you will see in the gallery, the mug was shattered. I heard the loose parts immediately upon removing the package from the Amazon Locker. I sat in my car and opened it up immediately to verify it was busted and initiated the return process right then from the Amazon app on my phone. I went home, printed out the shipping label and prepped the package to be returned via the Amazon Locker and went back the next day to drop it off. You use the same process for returning a package as you did when picking one up - enter the code you were provided and a slot will open up for you to place the return package inside. They guarantee a space for your package that will be there for about 24 - 48 hours or so, otherwise you can try for a slot on a space available basis for one month. Luckily the slot they reserved for me was just big enough for the package I was returning - I used their original packaging - and once it was shut inside the Amazon Locker my part of the return process was complete. Of course, I have images of the poor packaging for this very fragile item and did provide them packaging feedback. I could have re-ordered the mug right from Amazon and the same third party vendor but decided instead to go directly to the manufacturer. I suspect they will take more care with the packaging than Amazon and the third party seller did in my initial attempt to replace my wife's mug and surprise her. Despite the broken product in my situation, you can see the value in having one of these Amazon Lockers nearby for deliveries that you can not receive at home for some reason. Have you ever used an Amazon Locker for a delivery or return? Share your experience in the comments below and let us know how it went.